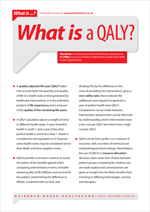 What is a QALY? | Whatis Series...? A quality-adjusted life-year (QALY) takes into account both the quantity and quality of life of a health state or that generated by healthcare interventions. It is the arithmetic product of life expectancy and a measure of the quality of the remaining life-years. A QALY calculation places a weight on time in different health states. A year of perfect health is worth 1 and a year of less than perfect health is worth less than 1. Death is considered to be equivalent to 0; however, some health states may be considered worse than death and have negative scores. QALYs provide a common currency to assess the extent of the benefits gained when comparing interventions in terms of health-related quality of life (HRQoL) and survival for the patient. Determining the difference in HRQoL combined with survival, and dividing this by the difference in the costs of providing the interventions, gives a cost-utility ratio; these indicate the additional costs required to generate a year of perfect health (one QALY). Comparisons can be made between interventions and priorities can be informed by understanding which interventions have a low cost per QALY and which have a high cost per QALY. QALYs are far from perfect as a measure of outcome, with a number of technical and methodological shortcomings. Nevertheless, the use of QALYs in resource allocation decisions does mean that choices between patient groups competing for medical care are made explicit, and commissioners are given an insight into the likely benefits from investing in differing technologies, services and therapies.